whether in our dreams or in the waking world. They may be the ponies on the moor, the sheep in a field, or the cat curled up on your sofa. You may be lucky enough to have a pet or to have had an encounter with a wild animal. Either way, you have a sense of their power, personality and presence. In Nandita’s Dream the animals are very important, just as they are for many tribal people. This power or presence of the animals is referred to as their medicine, and the people may adopt the medicine or spirit of that animal as their token or way of being, like the butterfly tribe or bear clan. So when we talk about the animals, we hope to honour their spirit and find out what gifts they may have for us. 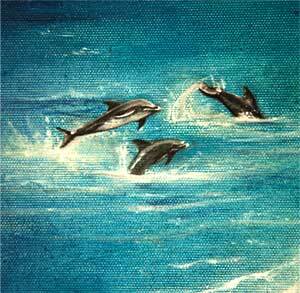 For example, if you are naturally shy you may find a bold, brave or exuberant animal like the dolphin could be helpful. Or if you are brave and bold and maybe need to learn about the feelings of others, the deer may come to show you the way. Animals all have their unique spirit, form and habitat, which all need to be acknowledged and respected, especially as we humans continue to expand and affect their homes. Animals have evolved, like us, to become the amazing creatures they are today, uniquely responding to where they live and those they live with. We want to share about the animals in the book, but we would also love to know what your favourite animal is, and why. Is it because it is so strong when it fights, or because it is so clever to find food, or is it because it is just so beautiful when it flies? Butterflies make you look up in wonder, just as in the book. They are amazing, because they start life as completely different creatures – caterpillars. Once the caterpillar has eaten it’s fill, it creates a cocoon or chrysalis. In there it completely liquefies, releasing new cells that feed off the soup that was once the caterpillar and rebuild it as a butterfly. 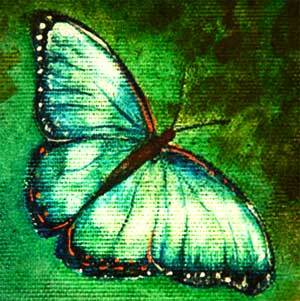 Today the butterfly goes around the planet, making us look and remember not only that change is possible, but also that it is the nature of life. In these times of climate change and other issues, we humans can look to the butterfly and learn how to melt in our hearts and reshape the way we are with ourselves, each other and the planet. Whales are the biggest mammals on the Earth. Legend has it that they have been here for all time and remember like a living library all that has ever happened on the Earth. That is a huge amount of information – more than in a Google search, and that’s a lot! They know it their bones, and sing it in their songs – yes, sing! Whales sing long songs that travel for miles through the currents in the ocean. If you are very still inside, you might be able to hear the whale’s song, which has a way of opening up your cells so that you relax and all the deep knowing that you have inside can come forth. Your own inner library of knowing. Turtles, like whales, have been here since the beginning of time – ancient animals who swim to serve, nurture and protect. Sounds a bit like a mum, always there for you. Turtles love to swim and float and feel, and they remind us that there is more to life than just thinking, as there are also feelings and we have a body, and there’s so much the body can and wants to do. So the turtle suggests that once you get an idea, you feel into it, and then get your body to take it up with the support and protection that your feelings naturally give you. Your feelings may say, “Let’s wait a minute until I feel safe before doing the idea,” as sometimes your mind or thoughts can be a bit of a bully. 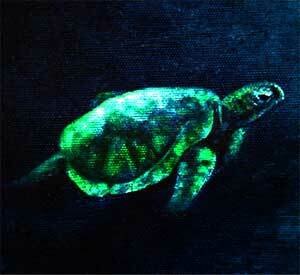 The turtle says all three parts of you need to agree, and then working together you are very powerful! Dragonflies have see-through, shimmering wings, so delicate that they seem as if they maybe relate to Faeries. They can fly at speeds of up to 36 miles per hour, and some say they are able to travel to other worlds. Their big, bulging eyes have a special way of seeing things; these eyes have 30,000 lenses and can see all the way around. 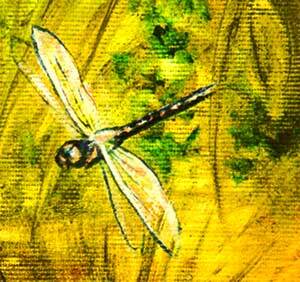 The tribal people say that the dragonfly can see through illusions. This means that things may not be what they first appear. 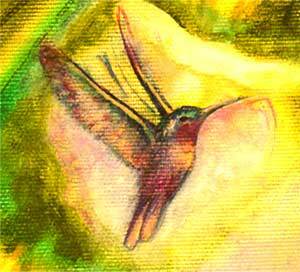 Hummingbirds search the flowers to find their sweetness. They have long tongues that push past the outer, often bitter layer to get to the hidden treasure – the nectar! Hummingbirds are the world’s smallest birds, yet they can hear and see better than we can; they can even see ultraviolet light. They joyfully and relentlessly seek their beloved nectar and in doing so pollinate the flowers, helping them to keep producing more flowers, which is great news for hummingbirds. I suppose the hummingbird’s lesson for us is that doing what you love is fun and joyful, and that when we are at our best it’s good for everyone. Deer are highly tuned, sensitive creatures, and they usually take off at the first sound or sign of movement. Swift and alert, deer are quick to pick up on what is going on; they watch and listen and then respond with care and thoughtfulness. 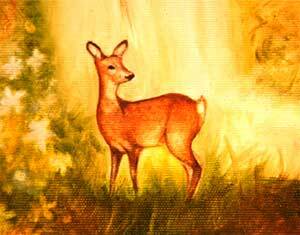 In the book, it is the deer who really sees what is going on with Luke, and with gentle kindness she is able to get him to trust The People again. Deer are very powerful, and their power is one of love and compassion.